Today’s post follows my theme lately of posts that differ from my usual style of fun food & drink recipes. I’m getting personal and sharing an honest dive into understanding why my typical food blogging style has come to a halt recently based on my lifestyle changes, and challenges. Lately I’ve been navigating some shifts in my body over the last four months that demanded full attention, exploration, and nurturing with special attention to my diet. To take away the mystery here and as the title suggests, I’ve been battling a hormone imbalance that was causing a major disturbance in my day-to-day life. I haven’t been drinking fun cocktails or creating and blogging new recipes because I’ve been entirely focused on balancing my body. As much as I love blogging, photographing food, and connecting with other bloggers, I gave myself the time and space to put health first. I think that’s something we all deserve – don’t you? The body signs that forced me to stop + listen. As a woman in my late twenties with no children, I started experiencing some body issues that took me back to the way I used to struggle in my teenage years. It started as a negative change in my skin and complexion, which I found the MOST frustrating. Acne KILLS confidence. It does, y’all, it just does. I tried to wave it off as temporary based on the time of the month, but it increasingly got worse… and worse. Then, I also noticed my monthly cycle getting progressively longer, more painful, and severely impacting those days of the month in the most negative ways. After continued months of worsened skin and monthly pains, my struggles continued with weight fluctuation at any given time of the month – no matter how active I was or how healthy I was eating. From October through November I was trying to get excited about the holidays on the horizon, but I couldn’t. I was becoming more and more depressed looking at myself in the mirror, anxiously dreading my monthly flow, and frankly… just feeling out of control. 1 – to practice openness and honesty about my health struggles in an effort to encourage more conversation and sharing of helpful information between women with similar issues. 2 – to be real about why I haven't been producing my usual recipe posts. I know that as a modern woman I shouldn’t feel so embarrassed about writing this, but I’ll be honest, this was HARDEST thing for me to write and openly talk about. I realize some people may never want to follow me or keep up with Cheers Years for recipes again because I took a side step off the perfect blogging path. However, I thought I would take a leap and share my journey to talk about my struggles for anyone else who can relate. I'm still creating recipes and have plans to blog more of those. However, I thought it was important to shed light on why my recipes and inspiration will be slightly different going forward. These past months of my life originally impacted my creativity and motivation negatively, but now have renewed my inspiration. I learned SO much about the systems in my body and how everything is connected reading WomanCode. Your body needs different things for each part of your cycle including food, exercise, & self-care. It may sound strange to life your life around your cycle at first. However, the more you read and think about it, the more it makes sense to sync your diet and lifestyle with your specific time of the month. We expect our bodies to behave and perform the same way everyday but they’re not static, they’re ever-changing throughout the months and years of our aging. Our body can be drastically different from week to week and need very different things. I experience this first-hand each and every day. Managing exercise and lifestyle choices are just as important as what you eat. Of course, wellness begins with the food we eat and how we nourish our bodies; but it’s not the only component that matters in managing your cycle and the effects of PCOS. While it’s important to remain active, the same exercises aren’t suitable for every day of the month. Additionally, we should prioritize self-care practices for our bodily and emotional/mental needs such as meditation, hot baths, face masks, or whatever allows you to relax and feel taken care of. Blood sugar management is EVERYTHING. From the beginning to the end of the day your body’s functionality depends heavily on our ability to manage our blood sugar levels. The 4-day cleanse in the book is all about detoxing your system and stabilizing your blood sugar levels in order to move forward in a more harmonious balance with your body and syncing your diet and lifestyle with your monthly cycle. For the first time EVER in my life I completed a “diet” or “cleanse” as it’s called in this book. It was only for 4 days, so it didn’t seem too overwhelming. In my opinion, I had a pretty healthy diet to begin with, though I do LOVE my coffee and cocktails (that’s what Cheers Years was founded on to begin with!). However, I didn’t have either of those things in the cleanse, and now I drink much less coffee and alcohol than I did before. I also added some ingredients to my diet in the cleanse and tried some interesting practices (like a fiber drink of psyllium husk first thing in the morning). Some food items I added, which I wasn’t consuming before included celery, bok choy, fennel, and parsley. Now these ingredients are a regular on my grocery list and I try to incorporate them into as many of my meals as possible. I also began eating a lot more berries, especially first thing in the morning and also as my dessert. I still try to do this and I’ve discovered just how wonderfully satisfying raspberries & blackberries are for sweetness satisfaction. By the end of my cleanse and to this day I learned to reach for fresh produce instead of "healthy" packaged goods, like lentil or plantain chips; because NOTHING beats fresh fruits and vegetables. During the cleanse I didn’t drink ANY coffee or alcohol. Instead, I drank green tea in the morning (which yes, does still have some caffeine) and peppermint tea in the afternoon for a perk up and had La Croix for an evening wine/cocktail replacement. My morning breakfast each day was a cup of berries with flax. 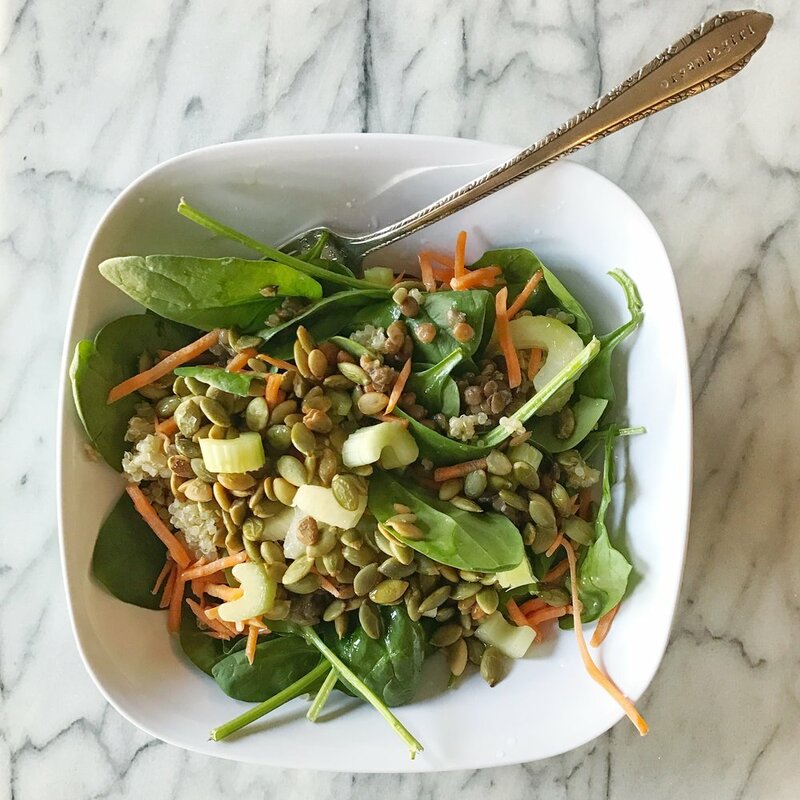 My typical salad included a base of spinach with carrots, celery, pumpkin seeds, a 1/4 cup of cooked quinoa, and a mixture of olive oil and apple cider vinegar dressing. My WomanCode soup that I made a large batch of before the cleanse. 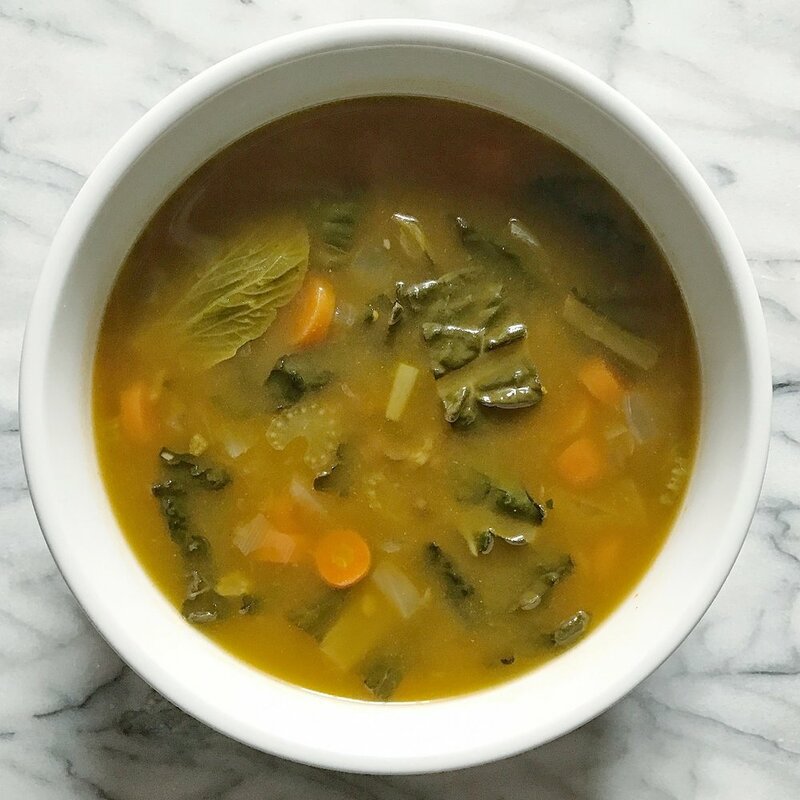 It's made with veggie broth, Tuscan kale, carrots, onions, lentils, bok choy, and some herbs. How this has affected my diet + lifestyle going forward. WomanCode was an AMAZING resource for me, and I would encourage any women struggling with their monthly cycle in any way to give it a read. I also know that it’s a great read for women during any stage of life, WomanCode touches on it all. My acne significantly cleared up for the first time in months. Those clusters of deep, cystic bumps I'd developed went down and stayed down. The bloating had completely vanished and I felt lighter, yet stronger because I was nourished with whole foods. My mood lightened, I felt clear-headed, and I was empowered! After reading through the whole book, I learned so much about my body and how to sync what I ate and did with my specific time of the month. I'm eating more intentionally than ever before, but not losing any flavor! Mediterranean spinach salad with hummus + baba ganoush with fresh parsley. Brunch egg scramble with spinach, onions, tomatoes, and quinoa topped with avocado and fresh parsley (plus a little hot sauce on top). I would highly recommend reading this book and keeping it handy as a guide for dietary choices, exercise, monthly tips, and self-care. This book floats between my nightstand and the kitchen now as I use it to reference the foods best for me at the time of my current cycle as well as tips for my monthly cycle and what exercise choices are best for me each week. As I mentioned before, it made me re-think my consumption of caffeine, alcohol, and pre-packaged food goods. I did slowly add back in ONE cup of coffee every few days (versus 2 or sometimes 3 each day) and I now still enjoy my wine and a good cocktail, but on fewer, more special occasions. I’m also VERY intentional about each ingredient I use or the wine I buy. I try to buy quality wine from my favorite local wine stores, as well as coffee. My grocery store visits are basically me pushing the cart around the perimeter of the store in a giant circle with one (maybe two) aisle visits. I start in the produce section and spend 80% of my time there. I collectmy fresh fruit and veg for breakfast, lunch, snack, and dinner ingredients. Then, I mosey over to the almond milk & goat cheese, followed by the frozen section for frozen veggies like cauliflower, broccoli, or chopped spinach so I can add these to stir fry dishes and soups. I will cut down an aisle for vegetable broths, legumes, nut butters, and quinoa or brown rice. My grocery visits are MUCH less stressful than they used to be. I feel like I game a strategy for going into the grocery store and know exactly where I’ll be spending my time. For whatever reason, I find that the produce section is not as crowded and has more space to move around (which is essential for me not losing my mind in the grocery store!). I also exercise different week-to-week and I LISTEN to what my body would like in terms of movement each day. Instead of forcing myself always do a cardio-intensive class like Spin or HIIT, I do lower intensity exercise that will help me remain active in a gentler way during certain times of the month. Prioritizing self-care has been a major lifestyle shift for me as well. I did take baths and do masks every once in a while. However, most of the time unless I felt like I *earned* the right to spend time on self-care or relaxation, I wouldn't do it. If I hadn’t got through my entire to-do list or finish a big project, then I wouldn’t deserving to take care of myself. Now I realize that these are the moments when I need it most. Recharging the body and mind are essential for producing great work when it’s focus time. Of course, I still push myself to accomplish a lot, but I give myself more grace and check-in with what my mind and body needs more regularly. It’s my hope and goal to move forward in creativity and love to make new, fun recipes and blog about them in a way that aligns with my new cycle-syncing diet and lifestyle. Honestly, these shouldn't seem drastically different but I didn't want to do this without sharing my experience and newfound passion for adding more fresh, wholesome ingredients. If you’ve read this far and this speaks to you, please know that I appreciate you, I care about you, and I can 100% empathize with your curiosity and craving for knowledge. If you’ve experience womanly body struggles and are thinking about a diet/lifestyle shift, comment below or drop me an email to talk it out. I SUPPORT your commitment! I’m excited to create more recipes that are nourishing as well as delicious to support a healthy body and HAPPY life that we can still CHEERS to each day. Here's to you for reading this post... Cheers!